Breitling Jets to Make Eastbourne Debut Thanks to New Airshow Sponsor - Military Airshows News & Press Releases. • Airbourne: Eastbourne official website. 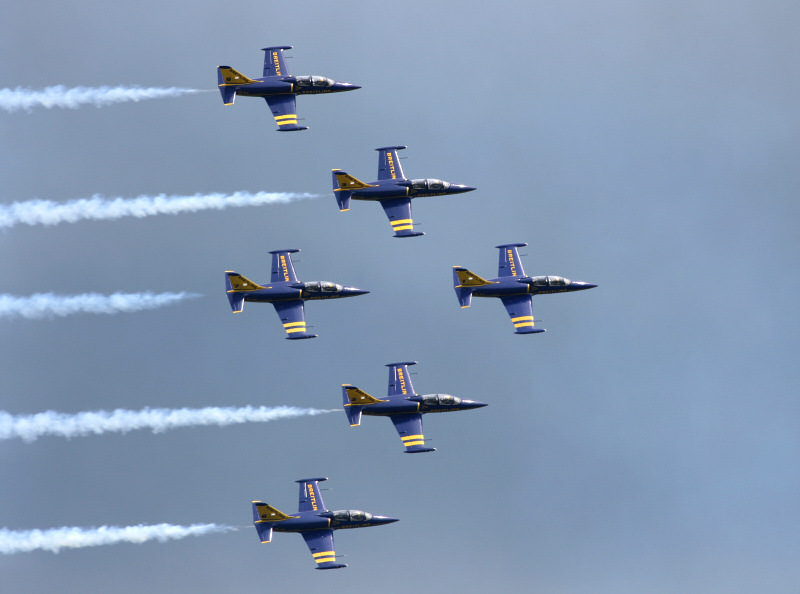 • Breitling Jet Team page. The world's largest civilian jet display team, the Breitling Jets, will be streaming across Eastbourne's skies this August, thanks to new airshow sponsor Ginsters. The world renowned French team will be bringing their magnifique headline act to Airbourne: Eastbourne International Airshow for the very first time, performing every day from 15 - 18 August. The team of L-39 Albatross jets, led by one of the world's most experienced pilots, Jacques Bothelin, are known for their close formation precision flying, often at just 3 metres apart, all while flying at speeds of over 700km per hour. Supported by the UK's biggest selling pasty producer, the free seafront airshow will also feature a range of fast jets, historic favourites, freefall parachutists, wingwalkers and night time pyro-aerobatic displays. Eastbourne Borough Council Lead Cabinet Member for Tourism and Enterprise, Cllr Margaret Bannister said "We are super excited to welcome the Breitling Jets for the very first time and our thanks go to Ginsters for their huge support in sponsoring Airbourne this year. We look forward to welcoming Jacques and his team extraordinaire for a sensational display over the sunny skies of Eastbourne this summer." Leader of the Brietling Jets, Jacques Bothelin said "We very much look forward to meeting the crowds at Eastbourne in our first ever display on the Sunshine Coast and can promise a spectacular four days of flying from the Breitling Jets." Airbourne returns from 15 - 18 August with more flying displays to be announced. The four day seafront show also features a military exhibition, helicopter pleasure flights, children's entertainment, Bandstand concerts, film screenings and much more. Entry is free. To beat the crowds and for prime views, keen aviators can upgrade to first class hospitality with High Fliers @ The Aviator Club from £99 per person and Sunday's Departure Lounge dining just £55 per person. Both offer exclusive dining and fully stocked bar in a private marquee and viewing area on the Western Lawns. Alternatively, reserved seats are available in the Exclusive Seating area all day from just £6 per adult (£4 per child).